It has been a lot of fun bringing this Ikea cart to life. It's always a little tedious at first with the prepping and sanding but the painting and staining is the perk not to mention the end result. But my favorite part was not having to spend any money on this project, at all, not a penny. Like I mentioned before when I first presented the project on Instagram, it was a hand me down. The paint was left over from our bedroom and antique wax I had handy also and with wax a little goes a long way. I have to tell you, I was excited when my mom brought this piece to me and originally I had planned to use it as an island in our kitchen and we even did a test run, but we kept bumping into it and although its not a big piece we are just already used to the open plan of our kitchen therefore I thought about it and realized I needed a Coffee Bar/Station for friends and family to just grab a cup of tea or coffee. Below are the items I had on hand and used to prep for paint. 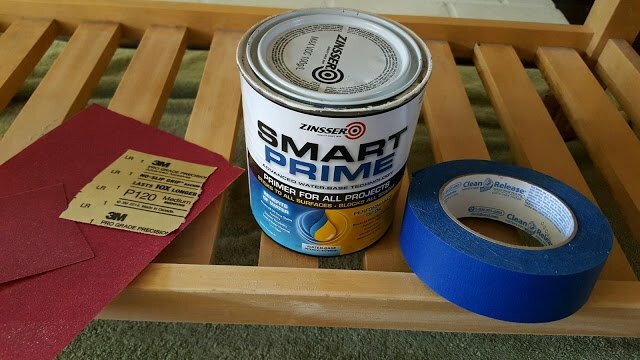 I used grit 120 sand paper, Smart Prime priming paint and painters tape. I then brought it inside because this particular week was windy and I didn't want that to disrupt the sanding or painting process if I happened to work in the garage or back yard. You want to start by prepping it for paint, giving a good sanding all around including the bottom just flip it upside down. I then I vacuumed and wiped off any dust from sanding. I then added painters tape where I wasn't planing to paint. Once the I gave it a coat of primer I let it dry overnight. The next day I gave it a couple of coats of Cobblestone by Country Chic Paint. I was debating on whether I should just leave the top and wheels in the natural wood color and just give it a clear wax coat or a wood stained look. I have plenty of both on hand but I decided to play around with the ANTIQUE wax. I literally gave it one coat on both the top of the cart and the wheels and I had the look I was going for. In case you're wondering, no, I don't mind that you can see all the old scratches and grain of the wood, I wanted this piece to look as though its been a part of the family, nothing new. Both the color and the smooth texture were exactly what I was hoping for. 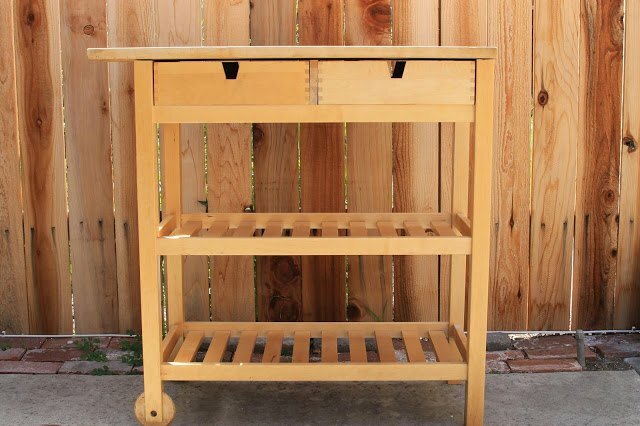 This IKEA cart looks great and turned out better than I expected. To say the least I'm very happy with how it turned out. Hope you're all having a great day, enjoying a cup of coffee and see you back here soon! This is so quaint and cute. So charming! I wish I was a DIYer! Thank you Jackie, honestly I still don't consider myself a DIY'er but I love trying! Very good idea! Love the finished product! Thanks so much Bren, still one of my favorite projects! Love this! Might do the same thing but use it for an outside garden potting table! Thanks Alex, and yes, outdoors it would look great too! Great idea! I wouldn't have thought of painting the cart. I definitely need this for my house. I love putting my own touch on stuff. I love it!